By providing a shock-absorbing layer of crushable material around your head, a cycling helmet is intended to reduce the damage to your brain if you are unfortunate enough to come off your bike and hit your head. Cycling helmets have come a long way in weight, fit and ventilation since the heavy brain buckets of the 1970s, so let's take a look at the features and details you'll find in a modern lid. A cycling helmet comprises a thick layer that provides shock absorption, with soft cushioning for comfort where it rests on the head. The main shock-absorbing layer is almost always made from polystyrene foam, though there have been attempts to use polyurethane foam and treated cardboard. See the index of all our helmet reviews. A thin plastic shell covers the foam to protect it from everyday nicks and scrapes. This shell is usually 'co-moulded' or 'in-moulded', that is, the outer shell is placed in the mould and then the polystyrene layer is formed into it. A few helmets still have thicker hard plastic shells, which provide some shock absorption in addition to the polystyrene layer, but add weight. The shock-absorbing layer and shell are held on the head with straps, usually made from some sort of synthetic fabric webbing and closed with a buckle. There's almost always an additional cradle at the back of the head to stabilise the helmet by grabbing the occipital protuberance near the base of your skull. 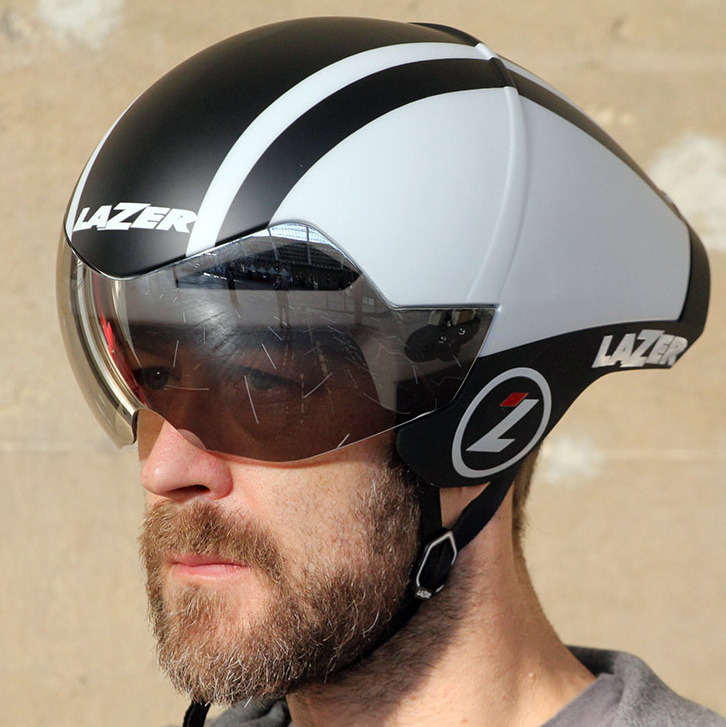 Big vents in modern helmets help keep your head cool. Since polystyrene foam is an insulator, helmets need ventilation to stop the rider's head from overheating. Early helmets simply had holes in the shell. Modern designs use channels inside the shell that allow air to flow over the rider's head. For a helmet to stay in place and be comfortable, it must be adjusted to fit the wearer's head. Most helmets have some sort of mechanism to adjust the fit on the occipital cradle at the rear of the helmet. Some helmets have internal reinforcing skeletons to hold them together in an impact. This allows for larger vents and air channels, and usually a lighter helmet, but the complication of including extra components in the moulding makes such helmets more expensive. In the European Union, helmets must meet the EN 1078 standard, which calls for a deceleration of no more that 250g to be transmitted to the head in an impact at 5.42-5.52 m/s (a little over 12 mph). The standard involves impacts on a flat surface and a kerbstone. In the US a Consumer Product Safety Commission (CPSC) standard applies. The two are roughly equivalent in terms of impact absorption. MIPS stands for Multi-Directional Impact Protection System. A MIPS helmet is claimed to offer additional protection against rotational forces in a crash, by allowing two layers of the helmet to move independently. The idea is that the outer layer moves when you hit your head, absorbing the rotational forces of the impact. MIPS was developed by the Karolinska Hospital and the Royal Institute of Technology in Stockholm, Sweden, so it's not proprietary to any one helmet maker. Helmet makers offering MIPS helmets include Giro, Scott, Smith, Bern, Bontrager, Giant, and Bell. Riders prefer lighter helmets for obvious reasons. The lightest helmet we've ever tested was the 185g Specialized Prevail S-Works; the heaviest was the Abus Performance at 640g. In practice, anything under about 300g is light enough that its weight won't be annoying. The cheapest helmets cost around a tenner, but decently ventilated ones start from around £30. 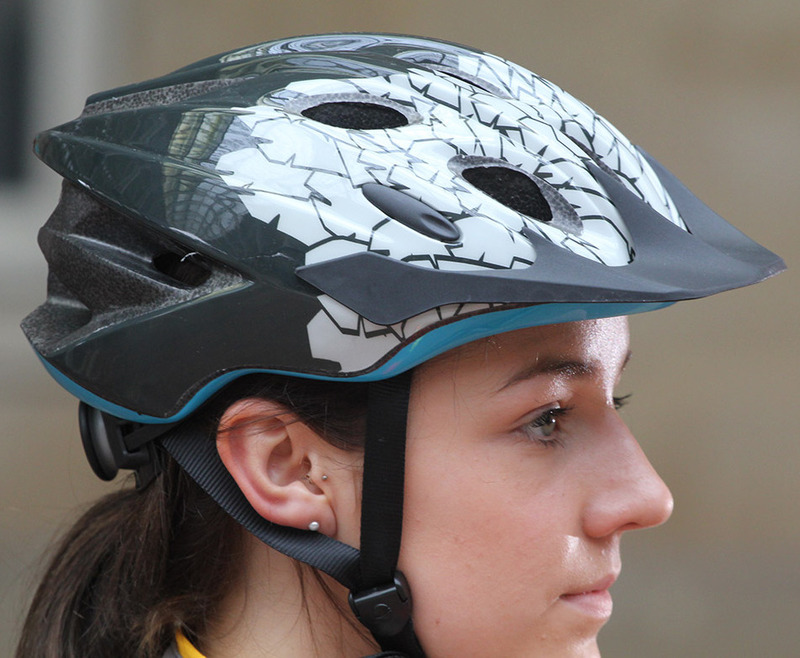 Helmets for general use go up to almost £200 while aerodynamic time trial helmets can cost £250. Helmets intended for mountain biking often have a peak or visor, which provides a degree of shade for the rider's eyes. The styling comes from motocross, but peaks are useful on the road too. They provide shade in summer, keep the rain off your glasses in winter and annoy people stupid enough to take The Rules seriously. Dedicated time trial specialists use helmets shaped to cut through the air, with smooth shells and long tails. Their shape has earned these helmets the nickname 'sperm hats'. They're effective if the tail is near the rider's back, but some find the effort of maintaining the right position fatiguing. Helmets with shorter, rounded tails provide most of the benefits without causing aerodynamic problems if you look down. A recent trend is for helmets with minimal ventilation and smooth outer shells to reduce air resistance for general road racing. Helmets for toddlers carried in child seats often have little or no ventilation so they help keep junior's head warm. 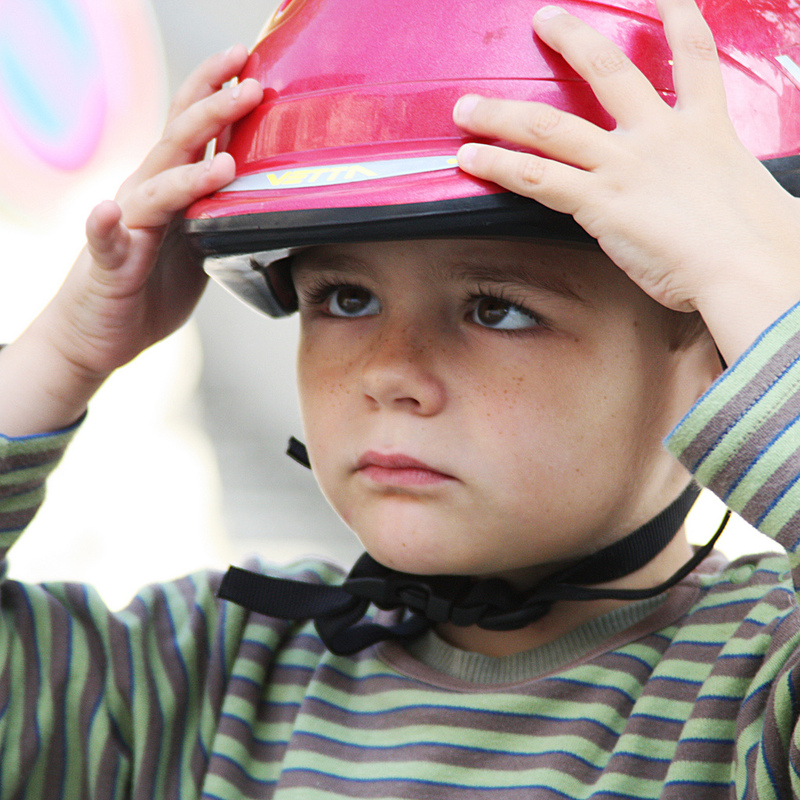 For older kids, helmet design is very similar to lids for adults, with the exception that they have buckles that release if the helmet gets caught on something so the straps don't throttle the child. A radically different approach is the Hövding cycling airbag, which comprises a collar that rapidly expands into a head-enclosing airbag when it senses movement consistent with a crash. At £249 it's not cheap, though some top-of-the-line racing helmets are similarly spendy. Hövding claims to provide "the world's best shock absorption capacity", an unusual statement for a head protection manufacturer, most of which seem to carefully avoid making any claims at all about their efficacy against impacts, aside from specifying the standards they meet. A note of appreciation for the peak / rule 5 sentence. Of course if you don't buy into them delivering on that "intention" then you don't need to know anything at all about cycle helmets. One thing that always frustrates me with regard to helmets is head shape. Some helmets I try on just look plain stupid, sitting on top of my head like a mushroom with the 'ear-arc' shape several CM above my actual ear. I'm not an alien but I am guessing that my head is more oval than standard. I guess people with very round (or wide but flat) heads have a similar problem. It would be good to get an idea which companies products are best for those of us without 'standard' heads. Hövding informed me that they have no plans to make a version that fits my head. Thanks a lot! 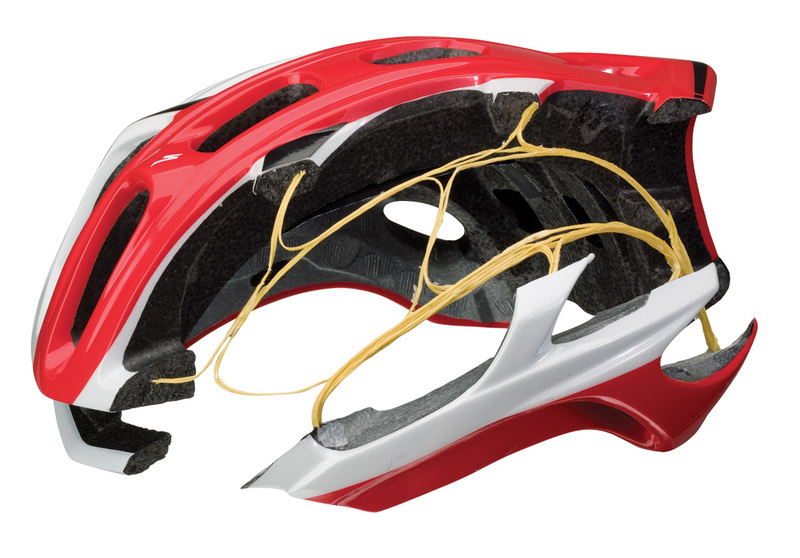 Cycling helmets last a lot longer than the 3 years replacement typically stated. The EPS foam degrades with exposure to sunlight and it can become brittle and crumble. If you look after your helmet and keep it in cool darl place it will easily last a decade or more. I have a Specialized Telluride from 2003 that is still in good condition, though I have had to replace the buckle. The EPS shows no sign of degradation (its resilient and doesn't crumble). I am careful to store it away from sunlight and keep it clean using a protectant like Aerospace 303. Its not my only helmet (I have one from Lidl), but it is the one I use most. I am reluctant to just throw it out because of a date. 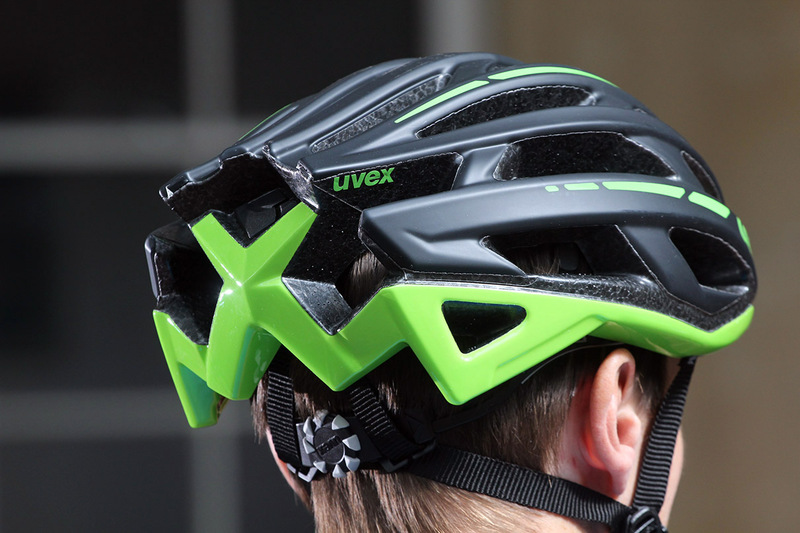 Im sorry to be an old fart but forget the rules, you need to flip up the skip on your 'ye olde' cycling cap whilst down in the drops, so having a non retractable one on your lid just says 'I dont use the drops' which is fine, but skips are for flat bar bikes. I dont follow the rules, but many do have some basis. I was talking to a mother the other day whose daughter has refused to ride her bike to school. After asking her why, she said that none of the other kids wear theirs and she didn't want to look stupid so she's not riding. The mother sat outside the school and counted 21 kids come out of the school not wearing helmets (very small town Kiwi school with a country wide helmet law). The mother complained to the school about not monitoring helmet wearing by the children. I guess we'll now have another 21 kids not riding their bikes to school. We were staying on a French campsite and my daughter asked how to find the British kids she could play with. I told her to try the ones wearing cycling helmets - worked every time. Don't you just love the way Brits on holiday learn all about a country from a week's holiday? Probably explains Brexit. I live in France (the hot bit), and without getting into the pro-anti argument, I'd say the proportion of French cyclists in my area who wear versus don't wear, is no different to my days in Scotland. (ie most do, some don't). I can remember when if you saw a cyclist in a helmet it would be a Yank. If they had a suitcase tied to their rack they would be Dutch. Does anyone know if using isopropyl alcohol to clean a helmet is ok or will it negatively affect the eps foam of the helmet? Thanks in advance.